This article will be used by teachers who wish to transfer grades from one period to another. 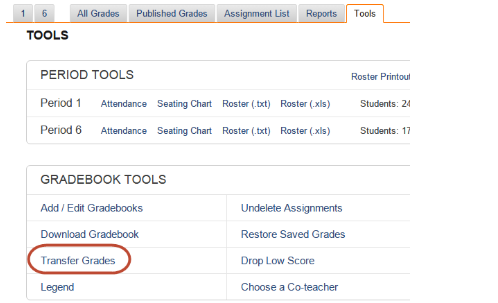 From the Tools tab in the Gradebook, click Transfer Grades. Use the Transfer Grades tool to select the student in their original class and the same student in their new class. After successfully following these steps all transferred grades should appear in the desired period.